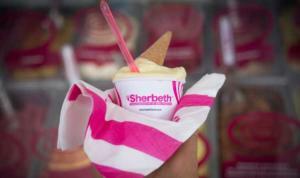 Join the X edition of Palermo Shertbeth Festival! Ice cream lovers: this is for you! Everything is ready in Palermo: this weekend’s weather will be sunny with mild temperatures, in via Maqueda, corso Vittorio Emanuele and Piazza Verdi the stands are ready to welcome thousands of ice cream lovers and the newly renovated Galleria delle Vittorie is ready as well to welcome meetings and award ceremonies. So the 10th edition of Sherbeth Festival 2018 can start! From Sept. 27th to 30th the enchanting Palermo’s city centre will host the amazing artisan gelato festival organized by Admeridiem and directed by the masters Antonio Cappadonia and Giovanna Musumeci. The 2018 European Capital of Culture adds another event to its already long list of festivals and celebrations organized so far. Palermo is a great travel destination for your autumn holidays in Sicily. Book now your stay in one of our fascinating Sicily beach villas! Sherbeth Festival starts on September 27th at 6.30pm with the official opening. On sunday evening at 10.00 pm don’t miss the last event when 50 ice-cream makers will kick off an exciting challenge. Four days of cooking shows, workshops, book presentations, activities for children with games and itineraries to discover tastes and flavors, art tours inside the old center and evening shows. It will be an opportunity to discover new tastes and proposals coming from far away, from Mexico, United States, Central Europe, Cayman Islands, Bolivia and Brazil. A great laboratory, directed by Arnaldo Conforto and Ruben Pili, will work non-stop to produce hundreds of thousands of delicious ice creams, which will be tasted and evaluated by the jury of the Festival chaired by national experts in this sector. There will be 2competitions: the Procopio Cutò trophy, entrusted to the jury of expert ice cream makers and journalists, and the Popular Competition, where you could vote through the official website. From Sicily to Lazio, from America to Japan, thousands of flavors that certainly deserve a taste. A joyful and sweet Festival, a must during your stay in Palermo! You’ll get the chance to discover some of the most beautiful Palermo’s mainsights while tasting the best ice cream in the world… What else do we have to tell you to convince you? Don’t miss the Palermo’ Sherbet Festival 2018. Book now your Villa in Sicily with Scent of Sicily!